I will start by saying that this week has certainly been an exciting week for blogger mail. I was recently given the opportunity to test out Save on Make up's services by choosing a few beauty items from their collection. Prior to their outreach, I was not familiar with the brand but I think their website offers a great concept, particularly if you are perhaps looking for a high end gift for somebody or a treat for yourself. They offer a wide selection of beauty products for a fraction of the retail price, ranging from Estee Lauder to Clinique and Benefit to Elizabeth Arden ; some of the items do not come with the original outer packaging and others may be travel-sized items, which inevitably lowers the price of the product. 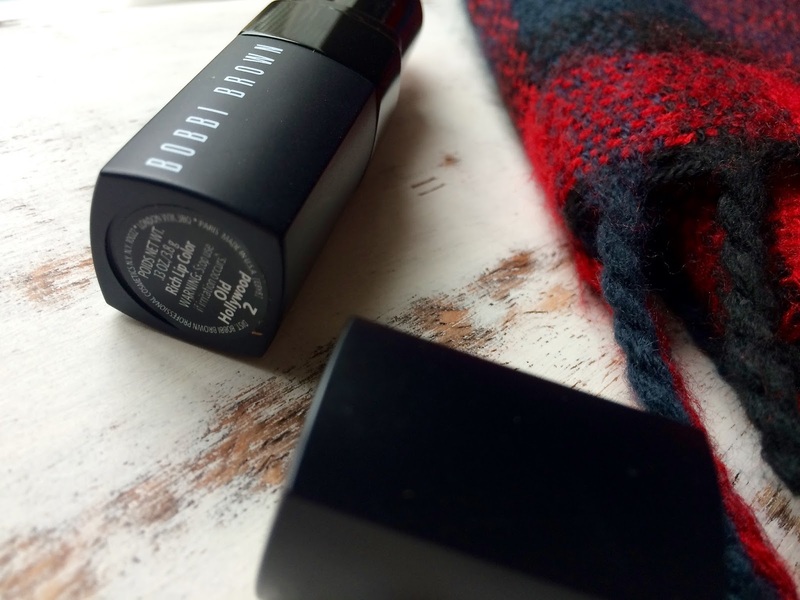 I myself, am a little bit of a sucker for packaging, and I was excited to find that a few of my favourite brands' items came in the original packaging, this included Bobbi Brown's Rich Lip Color in the shade ' Old Hollywood'*. I'm also a typical blogger and I will never use a beauty product until I've managed to take a few snaps in the packaging and upload them to Instagram. 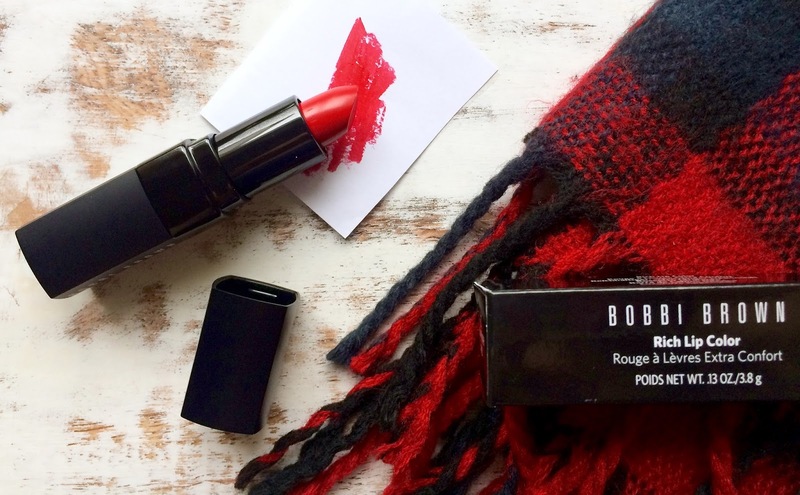 The lipstick itself is a gorgeous vivid red shade in the packaging, ever so slightly pink-toned upon application. 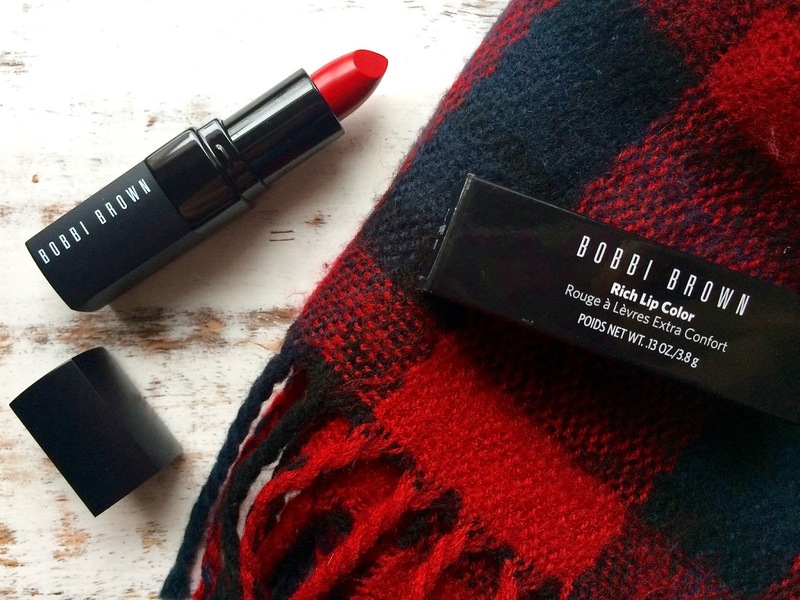 It's the perfect shade for a night out, or perhaps date night. I tested it out last night whilst out in Wembley and it managed to almost withstand the rain we got caught up in and the cocktails I drank; I only reapplied it once throughout the night. It's such a great staple item and I'm already looking forward to using it more throughout the winter months to add a bold pop of colour to my look. All of the items listed on the Save on Make up website are 100% genuine, however, from time to time you may run the risk of an item being a sample or tester. In my case, both of the items I received were brand new as if purchased in store. It's best to read all of the product details on the page first just to ensure the item comes in its original packaging and to suss out if there is any difference to buying the item in store but I think it's a great way to save money on high end products. If an item does happen to be a sample or a tester, this is disclosed on the website too. I will be featuring the second item that I chose on the blog soon, so be sure to check back to hear my thoughts. In the meantime, I hope you're all having a lovely weekend and making the most of the extra hour of sleep this morning. I know I sure did. This lipstick is looking so gorgeous !